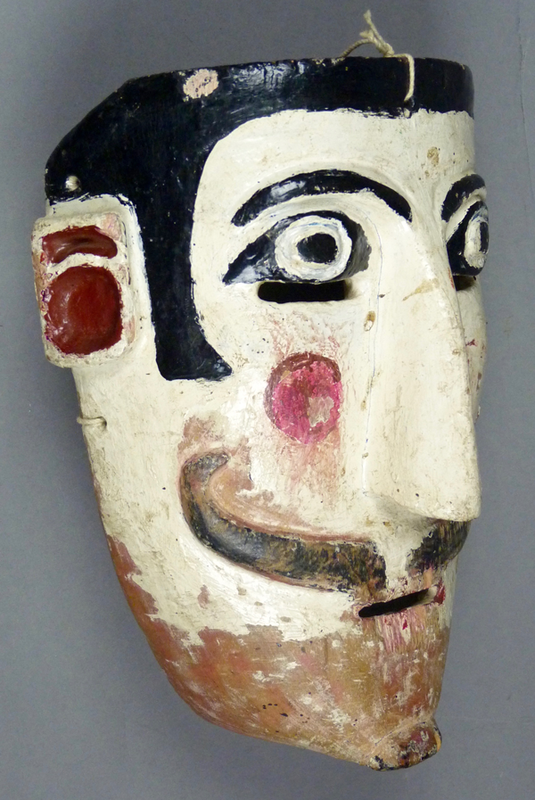 Two weeks ago I began a series of posts about Moro masks from the State of Mexico with a pair from the 1970s. To my surprise and pleasure, current Youtube™ videos demonstrated the persistence of those masks in contemporary fiestas, complete with their lunar headdresses. 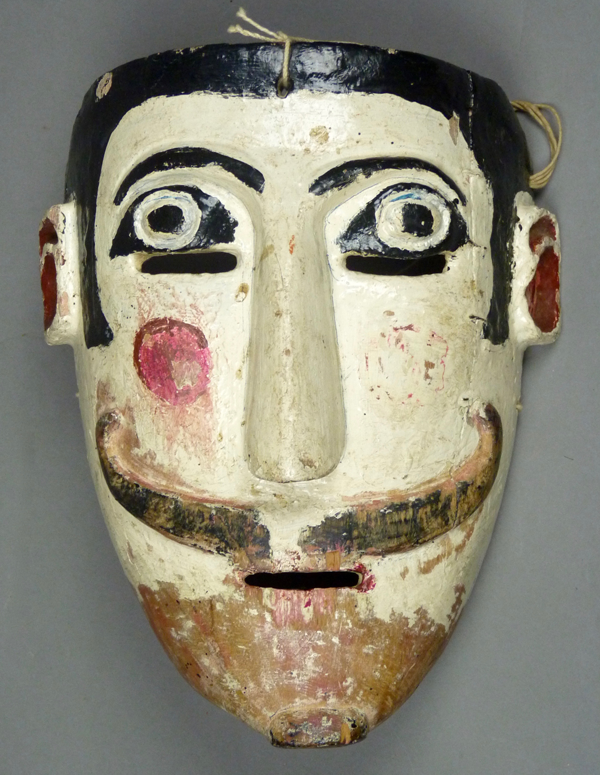 However, in last week’s blog I showed a trio of mid-century Moor masks of a design that had apparently been eclipsed by more modern and elaborate models. 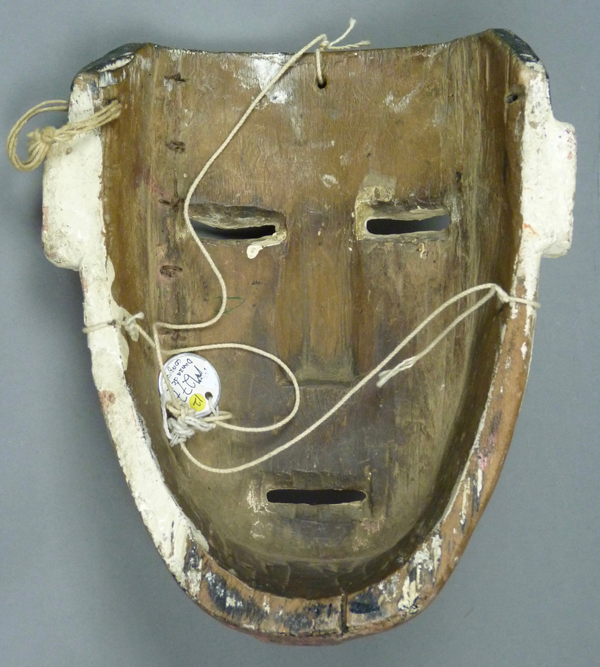 Earlier local mask designs seem to have had two possible fates—either they persisted and became more popular due to their strengths or they contributed traits and details in varying degrees towards a patchwork regional design. 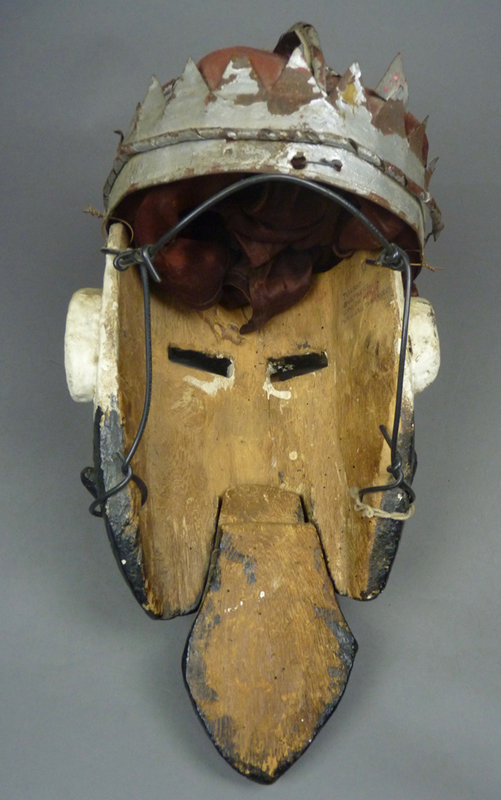 The lunar headdresses, for example, seem to have spread widely to other towns and inspired other novel headdresses. 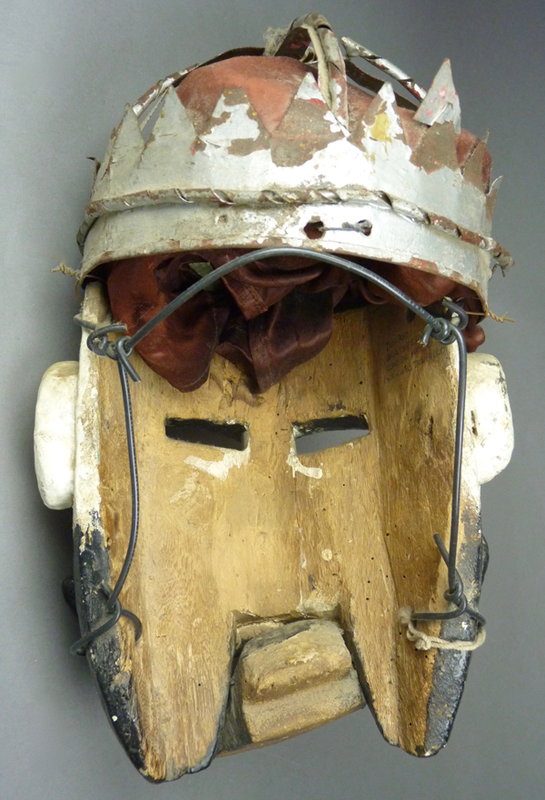 Today I will show another group of older Moro masks that are probably no longer in popular use. These three do not look at all alike, except that they all have white faces, and I have added on another white mask that is certainly rare, a Calavera (skull) mask that was also found in the Estado de Mexico. The first Moro, which I purchased from Robin and Barbara Cleaver in 1988, came with its original tin crown. Instead of an ordinary articulated jaw it had something far more interesting—an articulated goatee. It was found in Amatepac, Municipio of Tempilco, State of Mexico, and it was said to represent the Roman emperor Tiberio in the Moors and Christians dance. 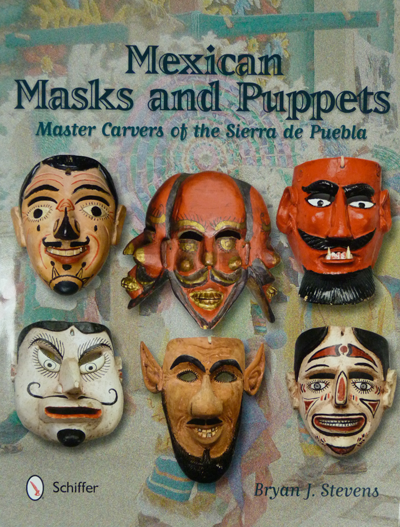 There is a nearly identical mask illustrated in Mauldin’s book, Tigers, Devils, and the Dance of life (1999, page 71); the Museum of International Folklore had bought that mask from René Bustamante, and it was said to have been collected in San Pablo de las Salinas, also in the State of Mexico. In Amatepec videos, the Moro dancers have pink faced masks and some wear gigantic lunar headdresses. 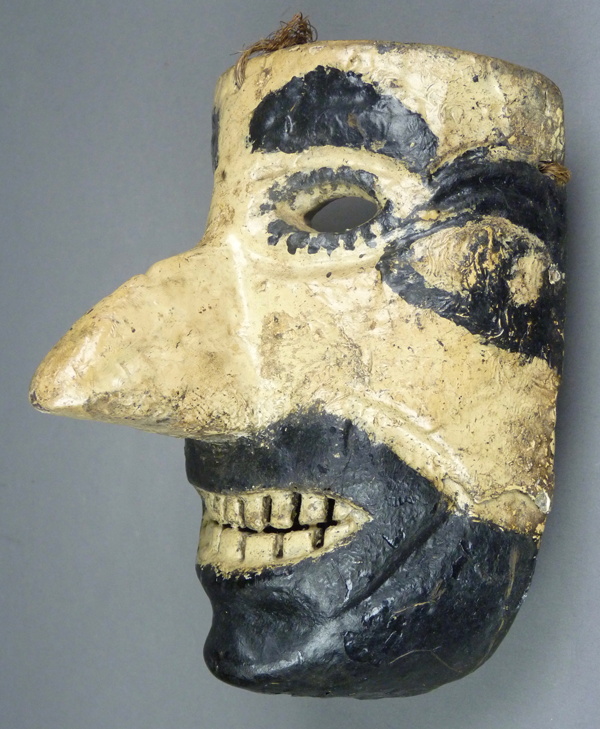 I did see one white mask that appeared to resemble our first mask, except that it had a beard made from animal hair instead of an articulated wooden goatee (at 3:45). I did not find a relevant video from Salinas. Here is the Emperor Tiberius/ Tiberio, with his tin crown. He would have been one of the Moorish leaders in the dance. Here also is his flapping goatee. 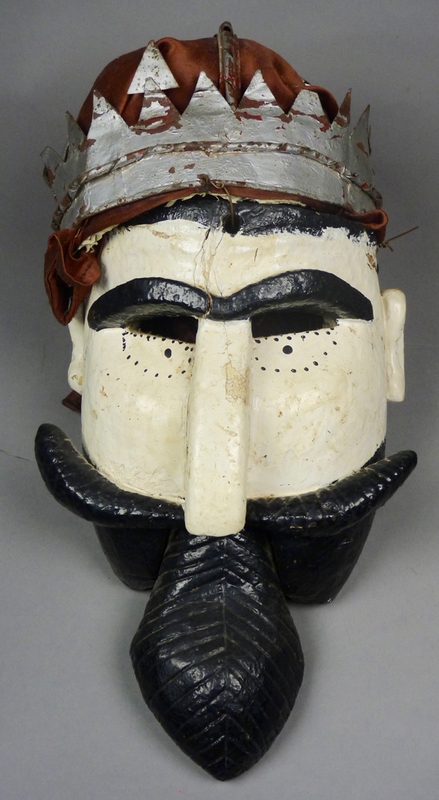 The ears and the mustache on this mask were carved separately and nailed to the mask, but I believe that the brows, nose, and beard ware carved in relief. A flap of red satin drapes the back of his head. 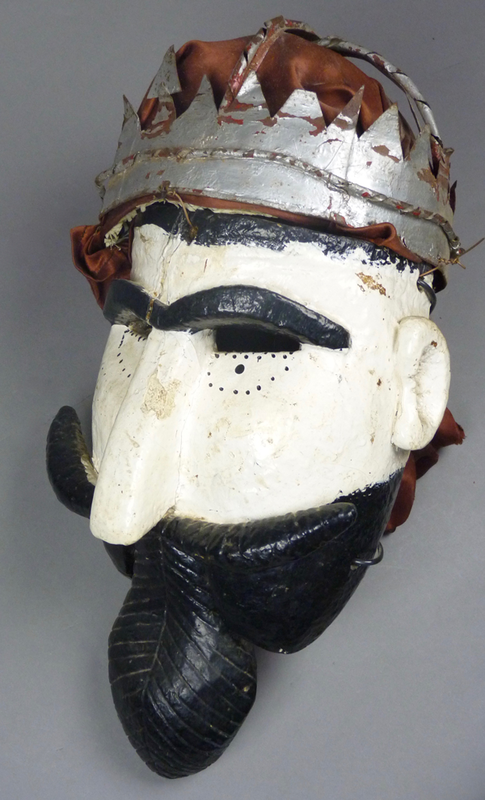 This mask is 11 inches tall (16 inches with the crown), 7½ inches wide, and 3½ inches deep, not counting the rim of the crown. A shelf on the back of the swinging goatee provides a place for the dancer to push out the goatee with his tongue. Here is the second white faced Moro in today’s post. I bought this one from Jaled Muyaes and Estela Ogazón, in 1997. It illustrates another common Moro expression—mean and threatening. I like masks with oversized noses, like this one. 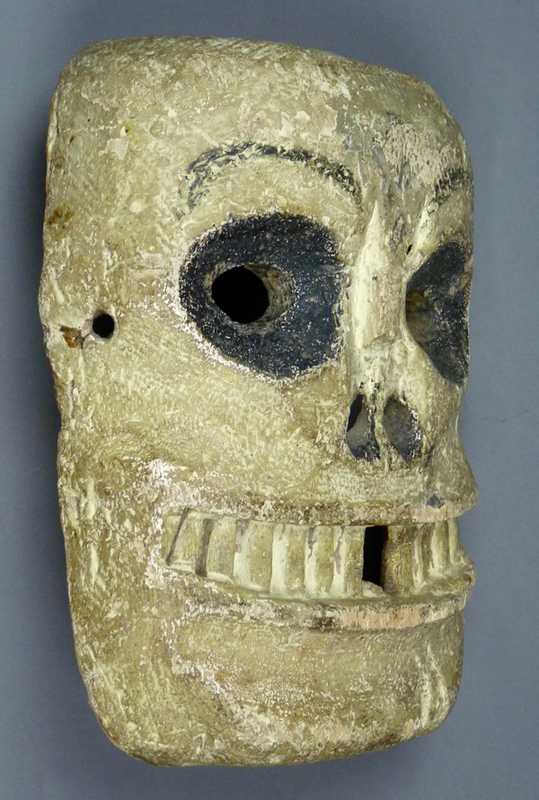 This mask is 8 inches tall, 5½ inches wide, and 5inches deep. The back was stained to protect the wood and the the wearing and smoothing of the surface became the indicator of age and use. The third mask resembles the three nearly identical pink faced masks from last week’s post. I like how the eyebrows and nose were carved as an integrated design; this was made by an artistically gifted carver. One can faintly see an old vertical repair on the left side of the face. I bought it from the Cavin Morris Gallery in 1994. 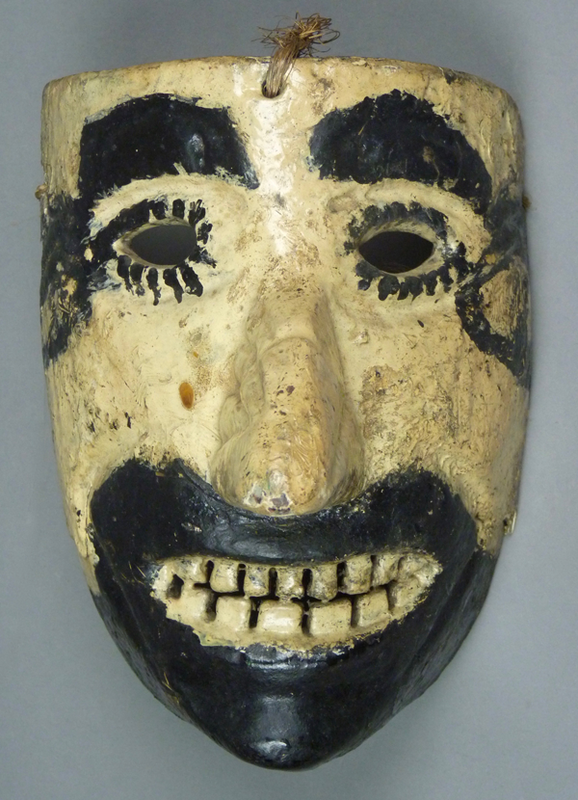 The mouth of this mask, although so simply carved, conveys the other common Moor expression or feeling, that of apprehension. The relief carved mustache curls with a flourish, the ears have an unusual stylized design, and the chin has a tiny prow. The paint is heavily worn. 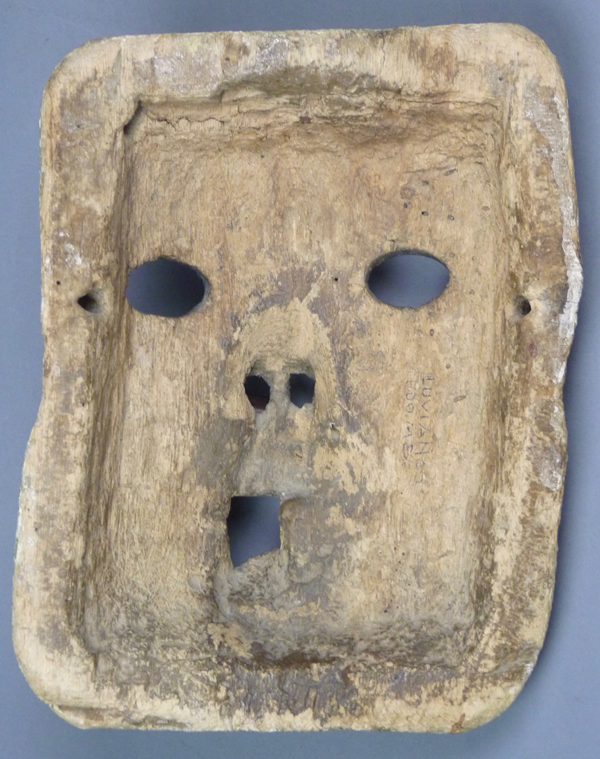 This mask is 8½ inches tall, 6¾ inches wide, and 3 inches deep. This back is carefully carved, and heavily stained from use. The old repair on the left side of the face is more apparent in this view. 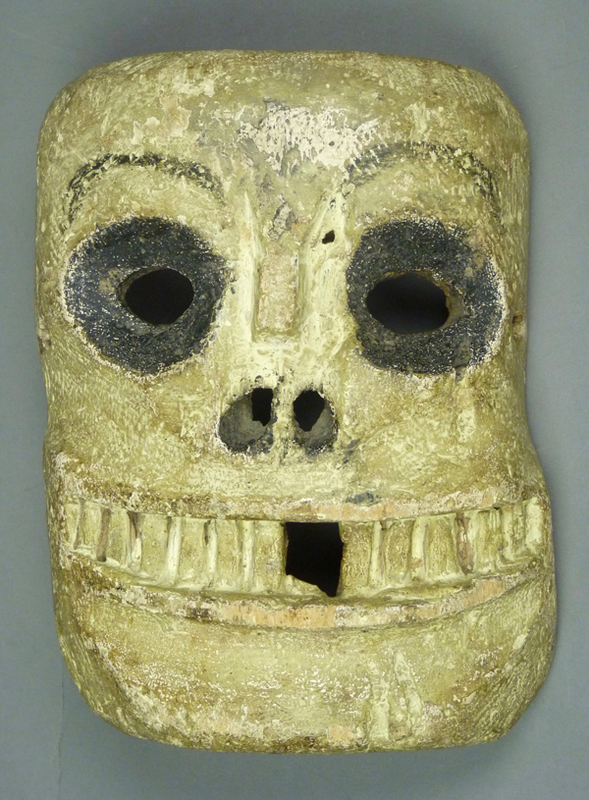 The final mask in today’s post is a Calavera, or skull, which I purchased from Spencer Throckmorton in 1995. This was found in Luvianos, a town and municipio in the State of Mexico. Skull masks are used in a variety of cultures and dances in the Mexican states of Guerrero, San Luis Potosí, and Oaxaca. Although such masks are less common in the State of Mexico, there is a popular dance performed in Luvianos and elsewhere in that state that may well have used this skull mask—the dance of the Concheros, Guaranis, or Apaches. The Concheros portray Indians of the Americas, who introduce the Spanish to death and defeat. It is unclear whether the gap in the teeth was part of the original design versus the result of later breakage. 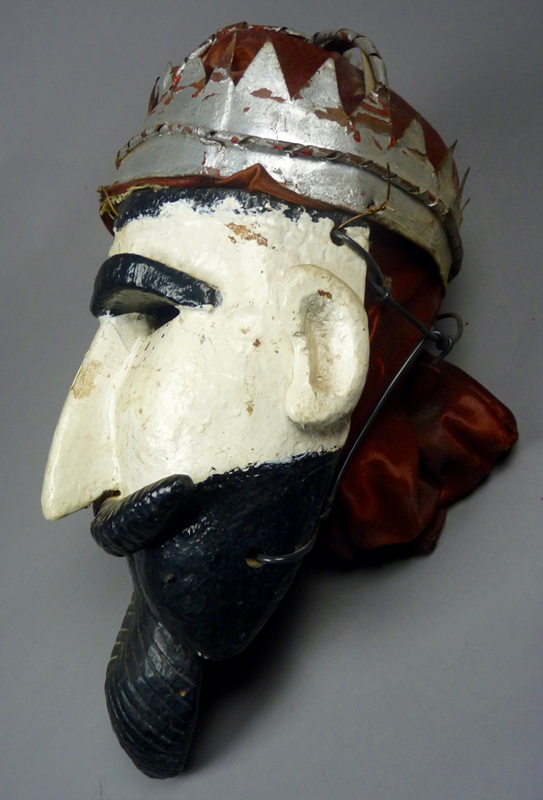 This mask is 8¼ inches tall, 6¼ inches wide, and 2 inches deep. It is unusually shallow. 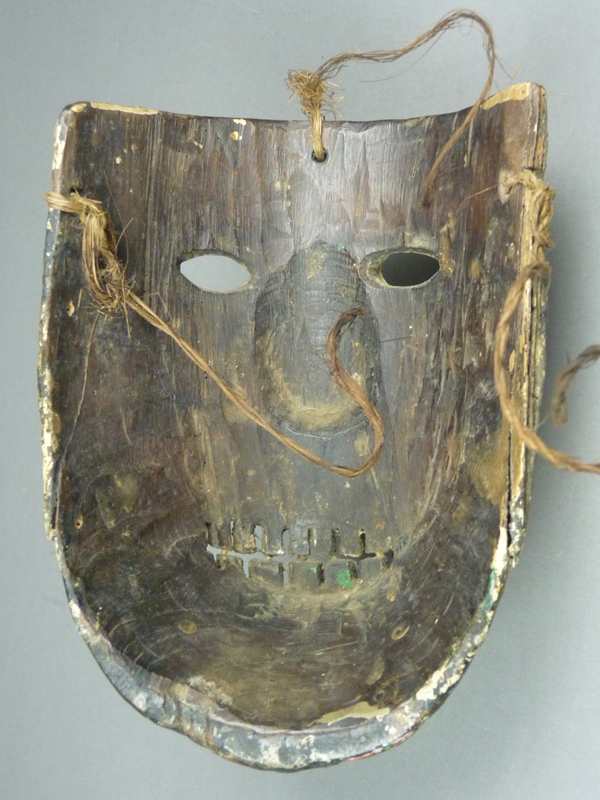 The mask was meant to be rectangular in shape, but it is actually cockeyed, as one can also see from the front. Here is another back that is darkly stained from use, as if it dates to circa 1940. Because the mask is so shallow, the dancer’s hair, nose, mouth, and chin had close contact with the back, and we find the most staining at those points of contact. I hope that you enjoyed seeing these rare and interesting masks. 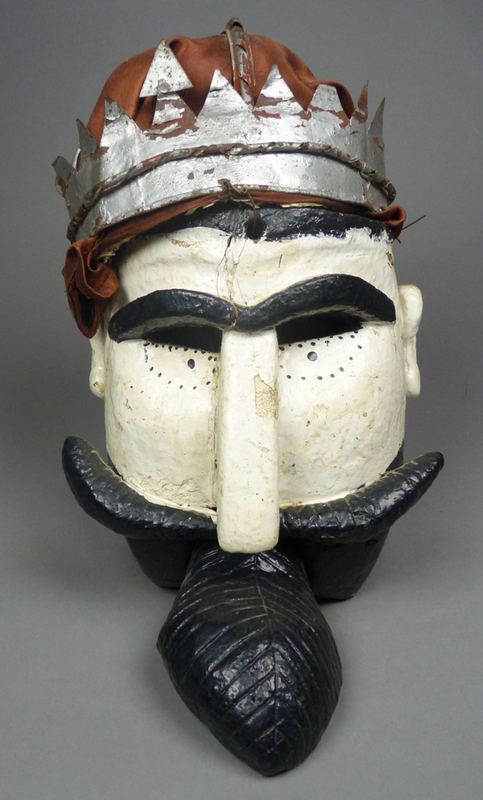 Next week I will show another cluster of Moro masks from the Estado de Mexico.